Welcome to the first post of Spring 2017 Lawn Fawn Release week! We are starting off the week with Elphie Selfie which is one of my favorite sets from the new release. Love those little elephants! I stacked up all my cute critters to wish a big happy birthday to their little birdie friend. I really love all the little accessories you can make the critters hold. In addition to using the new stamps I also used papers from both new paper collections, Watercolor wishes for the sky and Perfectly Plaid Rainbow for the grass. I also used the new simple grassy hillside borders to cut my green plaid and the new Sticky Note yellow cardstock for my base. 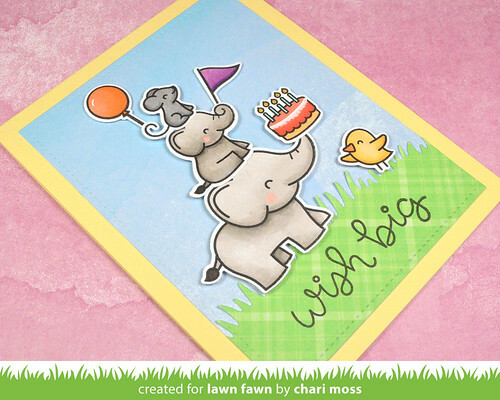 Be sure to check out the Lawn Fawn Blog all week for more projects with the new products as well as giveaways! So cute, love these hand written sentiments. Too much cuteness! Love the flag and balloon! Oh Chari, how cute are they stacked? Very clever! 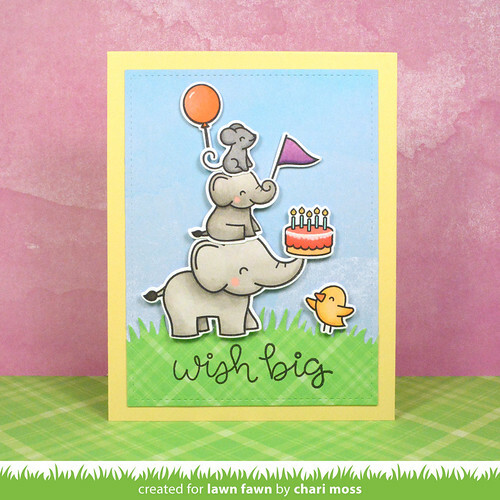 adorable card- love all the elements used for the card.